There is no shame in admitting an injury. The shame lies in the stubbornness to admit it and the foolhardy behavior that may lead to a chronic injury and inability to fully put the damage behind you. The most common injuries that are sport related are caused by strain and overuse. An overuse injury is caused by excessive wear and tear on the muscles, joints, bones, tendons and ligaments. Your body’s ability to deal with constant high impact and stress is eroded to the point of giving out. 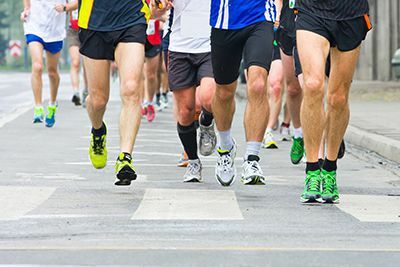 Podiatrists indicate that by far the most injuries they treat are running related. This may include runner’s knee, shin splints, sprained ankles, heel and arch pain and finally Achilles tendonitis. Each one of these injuries can worsen if the activity is not curtailed and the injury given sufficient time to rest and heal. By continuing the offending activity, symptoms increase, tissue damage becomes more widespread and the recovery time is increased. Also the injured site may weaken to such a degree that re-injury occurs and the patient never returns to pre-injury condition. Thankfully, many of these injuries if acknowledged and treated are fairly minor. A little time and rest will allow the injury to heal on its own. Further home treatments may include the following: ice, compression, elevation, over-the-counter anti-inflammatory pain medication, shoe inserts or possibly doctor prescribed custom orthotics. It may also be necessary to change the surface on which you run. Reduce the risk of injury by warming up and stretching, and also wear the right gear for your sport. You may also want to take at least a one-day break each week from the repetitive stress of your chosen sport. If the doctor says take two aspirin and call him in the morning, then do it! Our podiatrists at Dallas Podiatry Works always have your foot health as their highest priority. In order to recover fully from an injury, you should listen to Dr. Brook or Dr. Northcutt’s advice. Their only interest is in your recovery and seeing you back participating in the activities that you enjoy. For any foot or ankle injury, call them in Dallas at (972) 566-7474 or in Plano at (972) 943-3323. Their knowing what to do and when to get it done will help speed your recovery time. Make an appointment with Dallas Podiatry Works today.